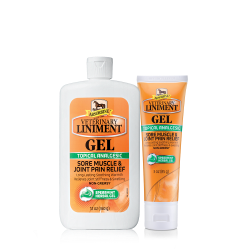 A targeted, warm, soothing treatment for temporary muscular soreness caused by overexertion, minor injuries, or arthritis pain, our liniment gel can also be used preventatively to loosen stiff joints, muscles, and tendons before work. Combines the same time-honored blend of Calendula, Echinacea, and wormwood herbs as our trusted Absorbine® Veterinary Liniment. Spearmint-scented gel contains natural menthol and herbal extracts. Powerful muscle, joint, and arthritis pain reliever. Convenient gel form for easy application. Menthol loosens stiff joints and reduces swelling. Options: 12 oz. 3 oz.